Зроблено спробу лінгвістичної інтерпретації психологічного змісту депресії на лексикографічному рівні з метою з’ясування подібностей і розбіжностей між психологічним трактуванням цього стану та його мовним наповненням у тлумачних словниках сучасної англійської мови. Розмежовано поняття депресивна акцентуація й депресивний стан, а також виявлено відповідні семантичні компоненти в структурі словникових дефініцій. Keywords: affect, depressed state, depressive accentuation, depressive personality, dictionary definition, emotional state, lexeme, semantic component, seme. Background: The radical change of the language paradigms implies the involvement of the achievements of other sciences, introducing new terms and notions in characterization of the language and its functioning. An increased interest in the emotional states of an individual is explained by their consequences and influence on the process of communication. Purpose: The article is aimed at defining the degree of correlation between the psychological model of a depressed state with its linguistic content, reflected in the definitions of modern English dictionaries. Results: The psychological diagnostics of a depressive personality and the semantic components included in the vocabulary definitions demonstrate a close correlation which is traced in the components of meaning, united in the semes sadness and anxiety. Discussion: Linguo-psychological model of depressive personality is based on the psychological model of the depressed state, reproduced on the basis of the analysis of psychological literature and specified by the linguistic content of the notion depression reflected in the dictionaries of contemporary English. We differentiate between the notions of a depressive accentuation and a depressed state, pointing out the semantic components that indicate both the features of the depressive disposition and the signs of the depressed state. The components included in the semantic structure of the lexeme depression are divided into two sectors: emotional states and symptomatology. The symptomatology is represented by three types of manifestation: physiological, mental-psychic, and behavioural. Key words: affect, depressed state, depressive accentuation, depressive personality, dictionary definition, emotional state, lexeme, semantic component, seme. Vitae Olena Karpina is the post-graduate student of the third year of study, speciality 10.02.04 ‒ “Germanic languages”, the Conversational English Department, Lesya Ukrainka Eastern European National University, Lutsk, Ukraine. The area of research interests includes communicative linguistics, linguistics of emotions, psycholinguistics, pragmatics, lexicology, lexicography. Ключові слова: афект, депресивний стан, депресивна акцентуація, депресивна особистість, емоційний стан, сема, семантичний компонент, словникова дефініція. Fundamental changes in the domain of XXIst c. linguistics led to the shift of the research vector from the language to its bearer. It involves the achievements of other sciences, introducing new terms and notions to characterize the language and its functioning (Kubriakova 4). Speech activity is complex in its structure, being subject to different factors and motives that arise from the human being, outlining the range of dependent phenomena. The relevance of the research is justified by the increased interest in the emotional states the individual is in, their consequences and influence on the process of communication. Recently, much research has been conducted in the field of linguistics of emotions. Scientific investigations of O. Ye. Filimonova, Yu. Kristeva, V. I. Shakhovskii, H. I. Kharkevych, O. Borisov, E. L. Nosenko, N. P. Kyseliuk, N. A. Melnychuk, Ya. Bondarenko, L. Koziarevych and others are devoted to the study of emotional states. The article is aimed at the defining the degree of correlation between the psychological model of a depressed state and its linguistic content, listed in the definitions of modern English dictionaries. The theoretical basis of the research is made up by the investigations of H. Kharkevych, P. Kutter, N. McWilliams, K. Leonhard, A. M. Sprints, P. Gannushkin, E. V. Geisler, et al. The structure of the personality consists of the individual type, the kind of primal trauma and the way of response to stressful situations (Geisler). Depressive characterological constitution is singled out in a separate individual type by many authors (McWilliams, Leonhard, Kutter). According to K. Leonhard, if the character traits assume an excessive distinctiveness, such manifestations can be considered as accentuation. At this stage of development it does not occur as pathology and can find a positive application, contributing to personal development (Leonhard 6). Despite the internal conflict, depressed people provoke general admiration and esteem. They are usually generous, sensitive and patient to other people’s drawbacks. People with the depressive dynamics are endowed with a great and sincere ability to love and self-sacrificing attitude (McWilliams). Thus, people whose individual type is defined as depressive (dysthymic in K. Leonhard’s typology) tend to experience negative emotions to a greater extent than positive ones. They are able to focus on negative events that contribute to re-experiencing grief. Depressive individuals are marked by an excessive response to minimal external stimuli, subject to sharp changes in sentiment (Geisler). Caused by early frustrations, this type of personality is distinguished by specific emotional manifestations and an extensive symptomatology revealed in physiological disturbances and behavioural reactions. Considering the type of accentuation, we should differentiate between the depressive personality itself, and the individual in the depressed state. When the character traits turn into painful symptoms, it signalises about the depressed state, which, depending on the type, differs in intensity of the devastating consequences (McWilliams). Since the depressive character traits predetermine the emergence of the depressed state, in the given study, we will apply the term depressive personality (hereinafter ‒ DP) with regard to both: an individual in depression (who does not necessarily belong to the depressive type, but is only subject to unfavourable circumstances) and a representative of the depressive individual type. In order to find out the degree of correlation between DP modelled by psychologists, and DP whose emotional and behavioural manifestations are verbalized in the domain of English vocabulary, we have compared the lexical representation of depression in contemporary English dictionaries with the psychological content of this state. In our research we analysed the dictionary definitions of the lexeme depression listed in six dictionaries that are characterised by the high level of informative value: Collins English Dictionary (CED), Cambridge Advanced Learner’s Dictionary (CALD), English Oxford Living Dictionary (EOLD), Longman Dictionary of Contemporary English (LDCE), Merriam-Webster Collegiate Dictionary (MWCD), Oxford Advanced Learner’s Dictionary (OALD). At this stage of the study we have pointed out common features and certain differences between psychological and linguistic content of DP. The destructive effect of traumatic factors arouses emotional reactions varying in duration and intensity, which in terms of psychology are known as affects (Geisler, Mc Williams, et al.). The psychologists particularize guilt and sadness as primary emotional manifestations of depression. The specificity of guilt lies in its ability to transform from the psychogenetic factor ‒ the real fault of the DP for the wrongdoing, into a long-lasting effect of “guilt feeling” ‒ the subconscious conviction in their own imperfection, which results in social rejection. 1. Guilt is an unhappy feeling that you have because you have done something wrong or think that you have done something wrong. 2. Guilt is the fact that you have done something wrong or illegal (CED). The guilt of DP is boundless (McWilliams). It leads to an extreme self-depreciation: they identify themselves incapable of anything, deserving of nothing but reproach and moral condemnation. Depressive people often overcome their unconscious dynamics by providing a philanthropic activity that enables them to withstand their guilt. Many individuals with the depressive characterological constitution restore the sense of self-esteem and avoid depressive episodes by doing good. Depression is a mental condition characterized by feelings of severe despondency and dejection, typically also with feelings of inadequacy and guilt, often accompanied by lack of energy and disturbance of appetite and sleep (EOLD). According to I. A. Sternin, semantic components put at the beginning of the definition are of particular importance (Sternin 9). Sharing this linguistic assumption, we can refer the lexeme guilt to the periphery of the semantic space of the notion depression. The validity of this decision is confirmed by the results of the inventory of the nouns forming the lexico-semantic group depression: the lexeme guilt does not demonstrate synonymic relations with the lexeme depression in the analysed thesauri (Karpina). Depression is a mental state in which you are sad and feel that you cannot enjoy anything, because your situation is so difficult and unpleasant (CED). Unhappiness is the feeling of not being happy; sadness (EOLD). Depression is a medical condition that makes you very unhappy and anxious and often prevents you from living a normal life (LDCE). Despondency ‒ low spirits from loss of hope or courage; dejection (EOLD). Physiological disorders of individuals in the state of depression are represented by the semantic components which denote such depressive symptoms as sleep and appetite disorders: disturbance of appetite and sleep (EOLD), increase or decrease of appetite and sleep (MWCD); being unable to sleep (OALD). Apathy, poor working capacity, inability to concentrate thoughts are also the signs related to a person in the state of depression. This considerable mental and physical fatigability, the inability to focus on the usual work was called asthenia (Sprints 89). The essence of asthenia is revealed in the following semantic components: inactivity (MWCD), difficulty in thinking and concentration (MWCD), inability to concentrate (CED), lack of energy (EOLD) etc. Depression is a mental condition characterized by feelings of severe despondency and dejection, usually also with feelings of inadequacy and guilt, often accompanied by lack of energy and disturbances in appetite and sleep (EOLD). Depression is a mental illness in which a person is very unhappy and anxious (= worried and nervous) for long periods and cannot have a normal life during these periods (CALD). Depression is the state of feeling very unhappy and without hope for the future (CALD). Dejection is a feeling of sadness that you get, for example, when you have just been disappointed by something (CED). Depression is a psychoneurotic or psychotic disorder characterized by sadness, inactivity, difficulty in thinking and concentration, a significant increase or decrease in appetite and time spent sleeping, feelings of dejection and hopelessness, and sometimes suicidal tendencies (MWCD). Psychoneurosis neurosis is based on an emotional conflict in which an impulse that has been blocked seeks expression in a disguised response or symptom (MWCD). Psychotic depression is characterized by intensity and duration of symptoms. The destructive state of mind transforms into intolerable depressive pain and leads to a conscious desire to commit suicide taking the form of an obsessive longing for death (depressia.info. Web. 22 March 2018.). This extreme manifestation of the depressed state is often called an act of self-aggression being embodied in the component of meaning suicidal tendencies. Thus, it was suggested only in a single dictionary. We should pay attention to the fact that not all the points declared in psychological sources have consistent correspondences in the lexical system of English. This can be explained by the fact that no lexical unit, including depression, is able to render the symbiosis of emotional states and the variety of signs and causes that constitute the depression complex. Thus, the lexico-semantic analysis of the lexeme depression and the lexemes used for its interpretation has not reflected the mechanisms of protection of DP such as introjection and encapsulation. McWilliams defines introjection as a subconscious internalization of the most hated qualities of the lost objects of love. Encapsulation is the alienation in order to preserve self-esteem (Kutter). In conclusion, the involvement of the results of psychological research demonstrates a partial-complete compliance at the linguistic level which made it possible to construct a linguo-psychological model of DP (Scheme1). The preconditions of the depressed state are determined by the type of individual defined as depressive accentuation. The individuals belonging to this type are inclined to experience negative emotions such as sadness, guilt, anxiety, despondency, dejection etc. The depressive accentuation is associated with the idea of reactivity that implies an extensive individual reaction to minimal external distractions. The latter may possibly vary in time: DPs are not satisfied with current situation, they may also be disturbed by the negative events of the past. The reactivity of the depressive individuals is also marked by hopelessness concerning the doubtful improvement of the life circumstances. According to H. Kharkevych, any emotional state may be represented by physiological, mental-psychic and behavioural manifestations (Kharkevych). In case of depression we deal with a wide-range complex of emotional states among which the emotional state of sadness and related to it emotional states of despondency and dejection form the basis of the whole complex. It is confirmed by the semantic components suggested by all the analysed dictionaries. As for the physiological manifestations they are mostly related to the disturbances of sleep and appetite. Mental-psychic manifestations explain the essence of the notion asthenia, which involves a broad mental weariness and inhibition of thought and concentration. And, finally, behavioural manifestations demonstrate the outward expression of the depressive behaviour which is disclosed by means of semantic components inadequacy, inability to live normal way, and suicidal tendencies. Geisler, E. V., and Drozdov, A. A. Psikhiatriia (Psychiatry). M. : EKSMO, 2000. Print. Karpina, Olena. O. “Leksyko-semantychna reprezentatsiia poniattia DEPRESSION u suchasnii anhliiskii movi (Lexico-semantic representation of the notion DEPRESSION in modern English) Naukovi zapysky natsionalnoho universytetu “Ostrozka Akademiia” Seriia “Filolohichna” 67: 141‒144, 2017. Print. Kharkevych, Halyna. Stan tryvohy v konteksti khudozhnioi semantyky (The state of anxiety in the context of fictional semantics). Lutsk: FOP Zakharchuk V. M, 2012. Print. 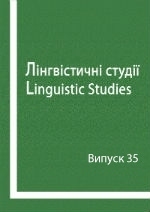 Kubriakova, E. S., Shakhnarovych, A. M., and Sakharnyi, L. V. Chelovecheskii faktor v yazyke: yazyk i porozhdeniie rechi (Human factor in the language: language and speech production). M. : Nauka, 1991. Print. Leonhard, Karl. Aktsentuirovannyie lichnosti (Accentuated personalities). Rostov-na-Donu: Feniks, 2000. Print. Sprints, A. M., Yeryshev, O. F., Shatova, E. P., and Filippova, Y. N. Psikhoticheskiie i nevroticheskiie rasstroistva u bolnykh s somaticheskoi patologiiei : rukovodstvo dlia vrachei (Psychotic and neurotic disorders in patients with somatic pathology: manual for doctors). SPb. : SpetsLyt, 2007. Print. Sternin, I. A. Metody issledovaniia semantiki slova (Methods of studying the semantics of the word. Yaroslavl: Istoki, 2013. Print. Cambridge Advanced Learner’s Dictionary Web. 22 March 2018. http://dictionary.cambridge.org/dictionary/english/. Longman Dictionary of Contemporary English. 3d edition with new words supplement. Edinburgh Gate, Harlow: Pearson Education Limited, 2005. Print. Merriam-Webster Collegiate Dictionary. Merriam Webster, Inc, 11th edition, 2003. Print.